Uranus is the seventh planet in the solar system, in between Saturn and Neptune. It is about four times the size of Earth, but compared to its large neighbor Saturn, Uranus appears very small. Like Saturn, Uranus is a gas planet and has rings, but the planet is different from the other gas planets. 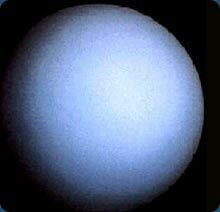 For one thing, Uranus contains methane in addition to hydrogen and helium. This methane causes the planet to appear a blue-green color. Also, Uranus has a core made of molten rock. At least 15 moons circle Uranus. The largest five are Oberon, Titania, Umbriel, Ariel and Miranda. The average distance between Uranus and the Sun is about 1.75 billion miles, which is about 20 times the distance between the Earth and the Sun. This great distance causes a year on Uranus to last a very long time—about 84 Earth years. A day on Uranus is shorter than an Earth day, at just 17 hours.